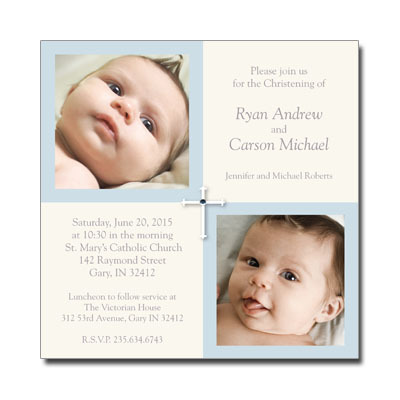 Soft beige and light blue are the perfect baby colors for this Christening invitation. Two photos of your twins are featured in opposite corners with a cross joining them in the center. A dimensional crystal jewel rests on top for a touch of sparkle. Card measures 5.875in. square and comes with stick-on jewels; light assembly is required and additional postage is needed when mailing.